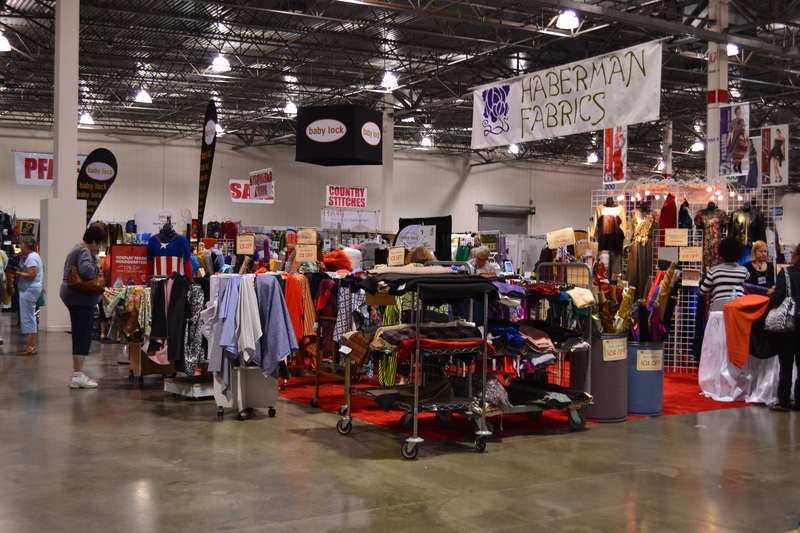 The best thing about September in Michigan just may be the American Sewing Expo. 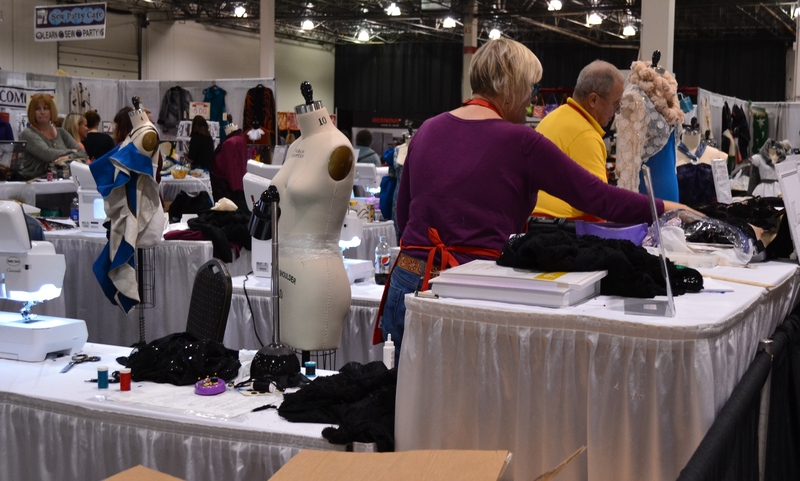 This annual, multi day event in Novi, a suburb northwest of Detroit, attracts sewing enthusiasts from all over Michigan, Ohio, Indiana and Canada. 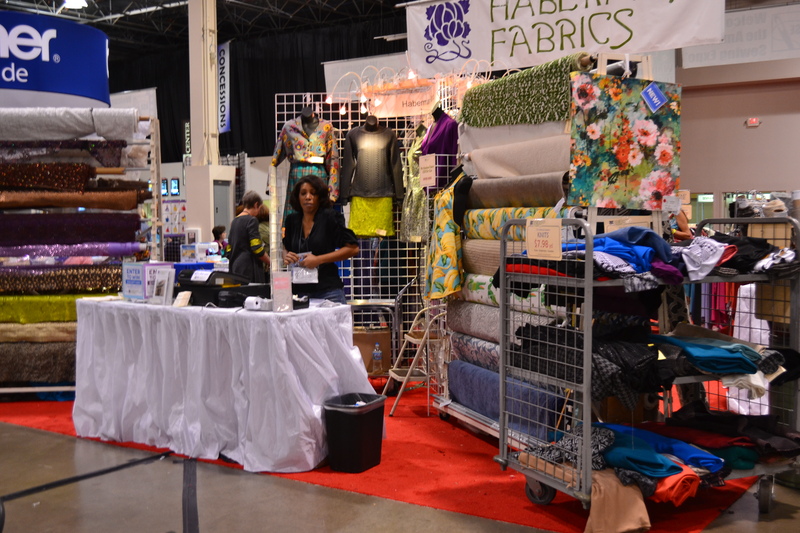 If you haven’t been to a sewing expo, imagine a giant show floor full of venders selling sewing machines, fabric, patterns, notions, threads, trims, and just about everything else you could want. Yes, it’s a little bit a sewing heaven. Add in all the displays, classes, workshops and fashion shows and you have a oh-my-goodness-what-do-I-do-first dilemma. This was my 6th year attending and I think I finally found my balance of time shopping vs. attending classes. 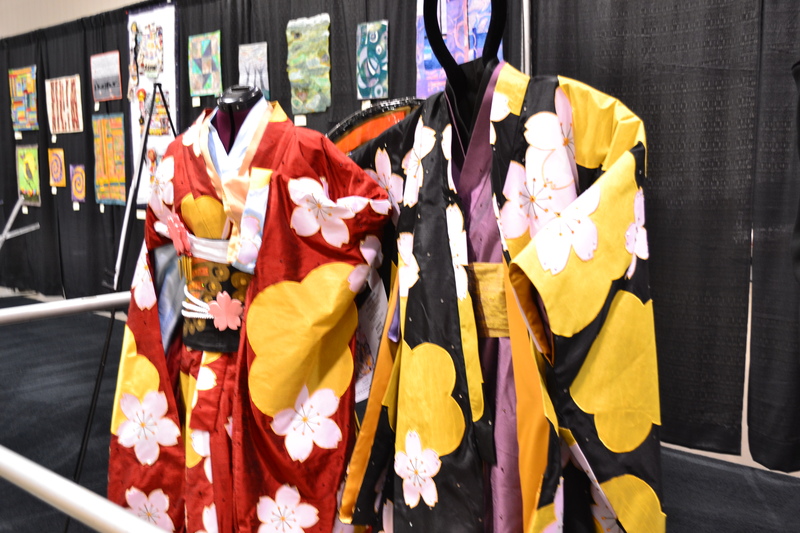 There is so much to share about the Expo, it will take two postings. First up will be shopping and some of the displays, then next week’s post will be about classes. 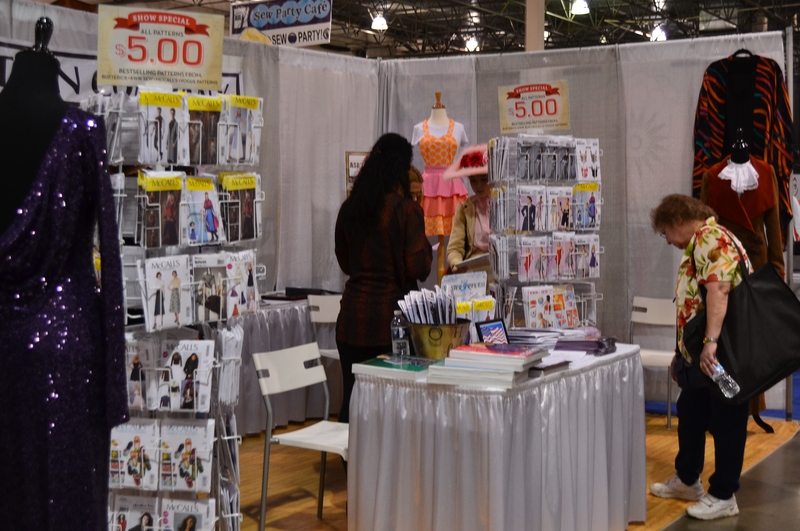 I was selective with my shopping this year, with a major purchase made minutes after arriving at the Expo. After decades of sewing, I finally bought a serger. I was planning on the Baby Lock Imagine, but went with the Enlighten instead. 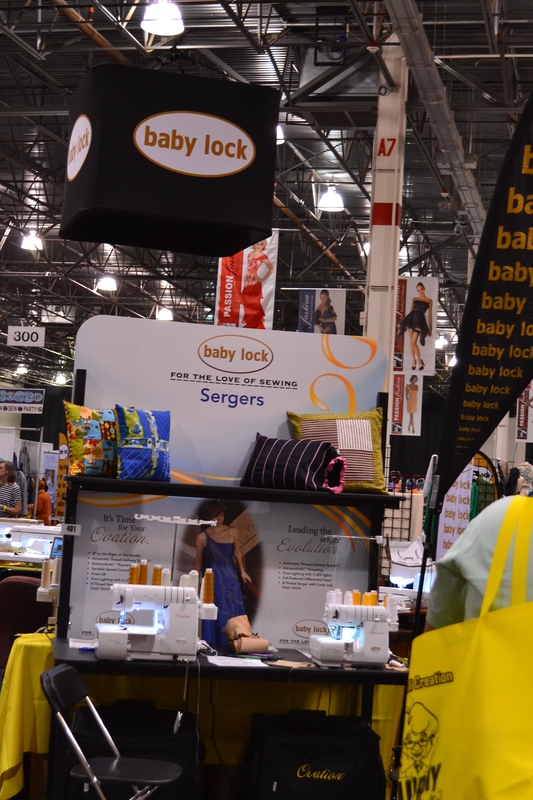 Most of the sewing machine companies are at the expo, so it can be a great place to comparison shop. 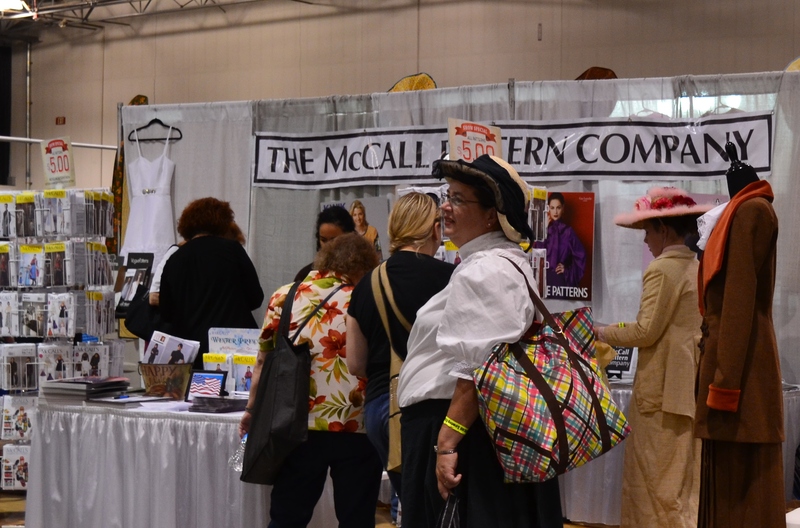 I met Meg, who’s posts we have been reading on the McCall Pattern Company blog. She already has a blog post from the show and photos from their fashion show on Pinterest. It was fun to chat with her, I enjoy reading her posts about the behind the scenes individuals who work at the smaller than most people think company. She has been working on her Ralph Rucci coat for the Sewalong and may have convinced me to give it a try. I bought the latest issue of Vogue Pattern Magazine. I let my subscription lapse when they changed it, but now it’s back, even better and time to get a new subscription. 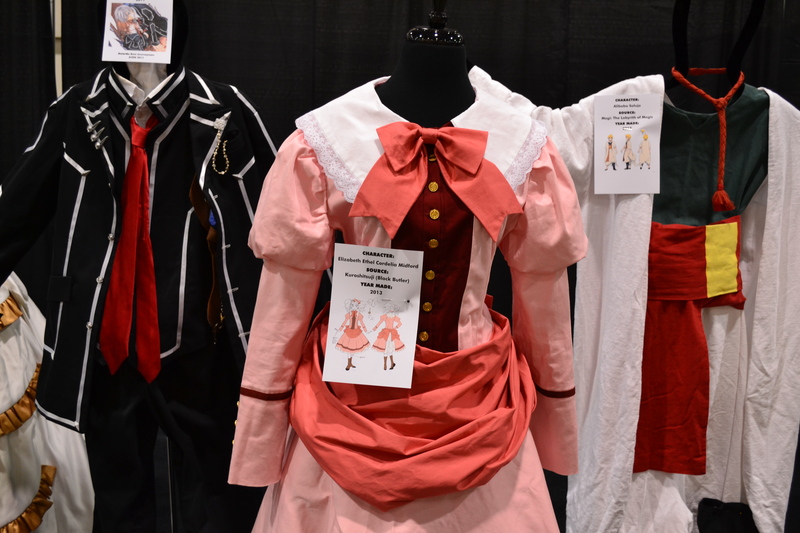 Can you tell the Expo had a Costume/Cospay theme? McCall also brought along some of their designers, including David Tutera, Khaliah Ali, Joi Mahon, Katherine Tilton and of course, Gertie aka Gretchen Herst. 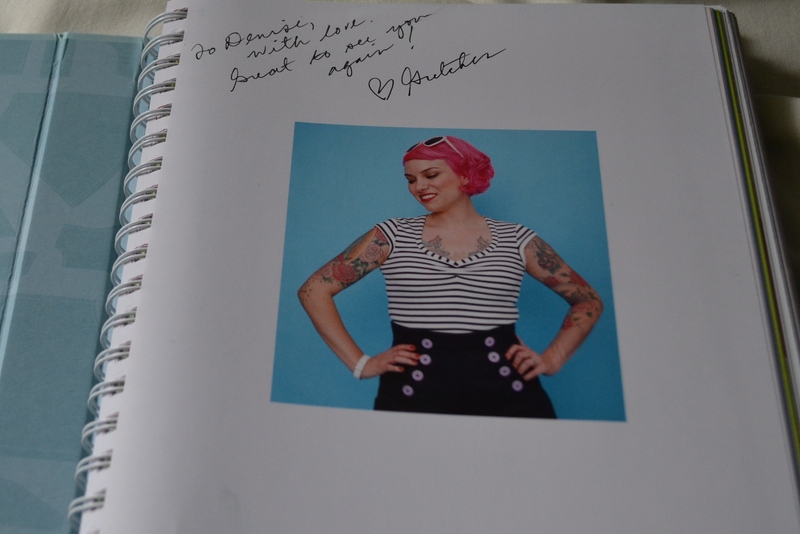 Gertie was in the Social Media Lounge signing her latest book. The skirt she was wearing is from the book and absolutely gorgeous. My photo doesn’t do it justice. 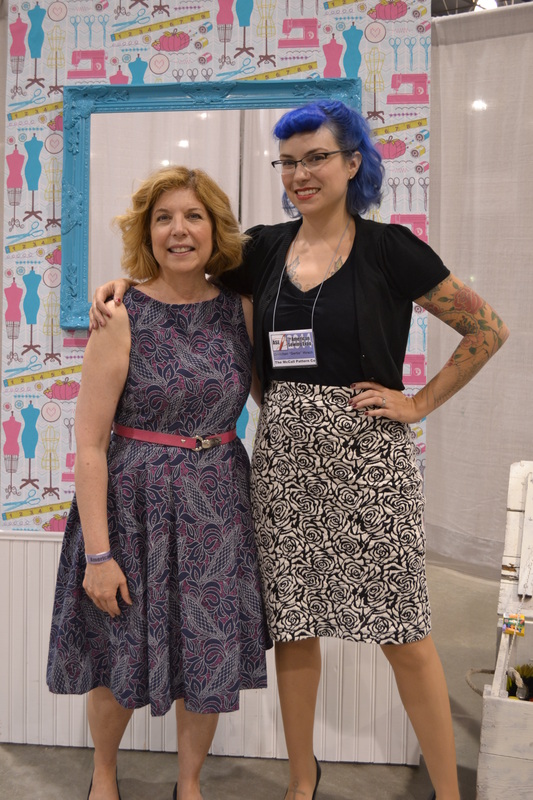 She is one of the nicest people and told us she is already working on her next book, which will be dresses and include a variety of bodices and skirts. Since dresses are what makes up most of my wardrobe, I’m looking forward to it. 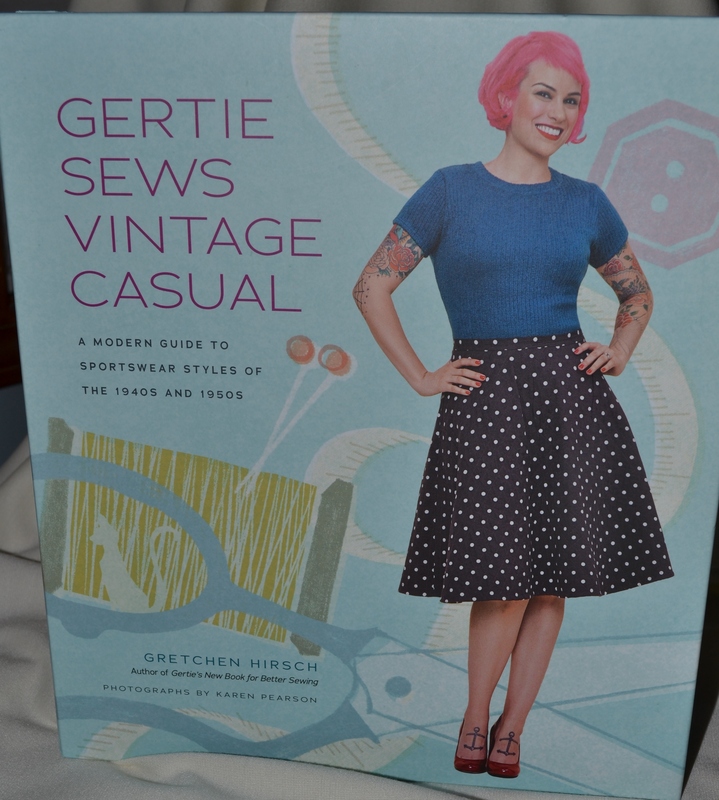 There is a great cardigan in this book I want to try. I also bought a book by Emma Seabrooke on trims. I want to try some of her methods to see if they will work for trimming a Chanel style jacket. 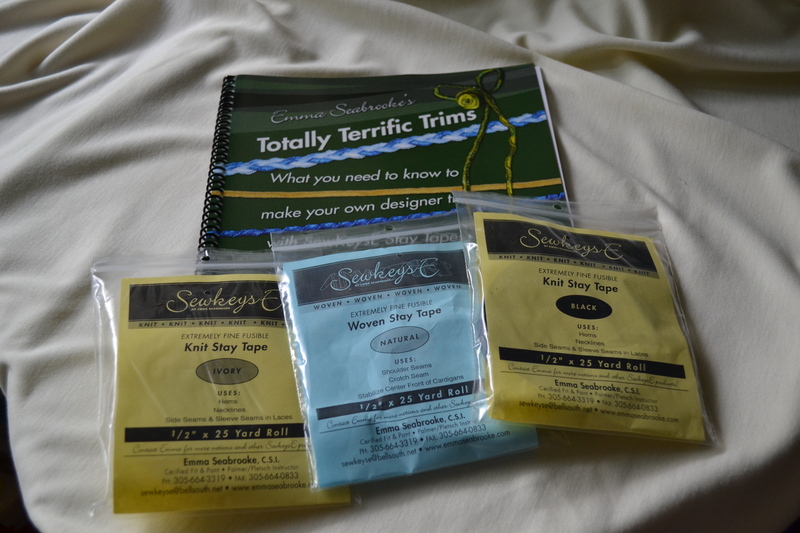 Of course I had to stock up on SewKeyesE Stay Tape, love that stuff. There were a few booths with trims, but Trims on Wheels seemed to attract the biggest crowd. They were cheery and helpful. I bought some frogs for a coat I’m planning, along with a roll of velvet ribbon and an rose applique. The prices were great, the frogs were only $5 a piece. Since I had splurged on the serger, I was less tempted by fabric this year. 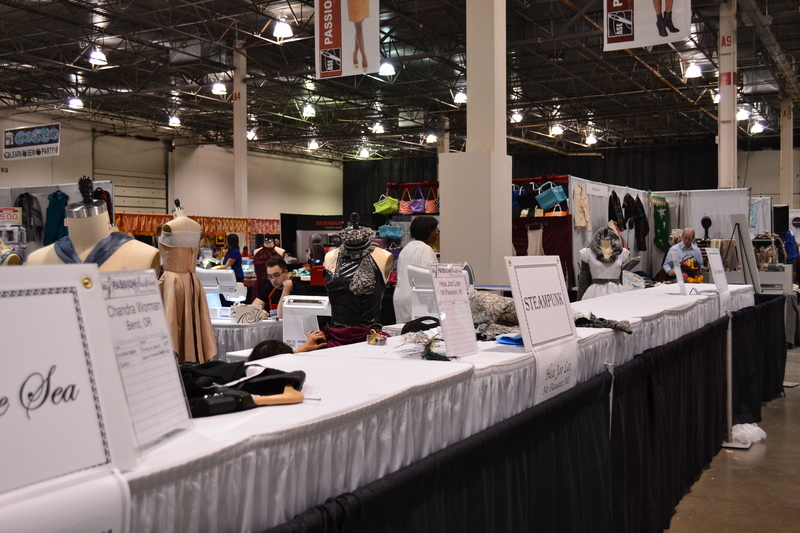 At the crazy busy Vogue Fabrics booth I picked up 2 pieces of soft, medium weight Sophia knit in solid black and ivory. These should be great to try out on the new serger. What looks like black and white tweed is a raw silk. How often can you find nice pieces of leather? 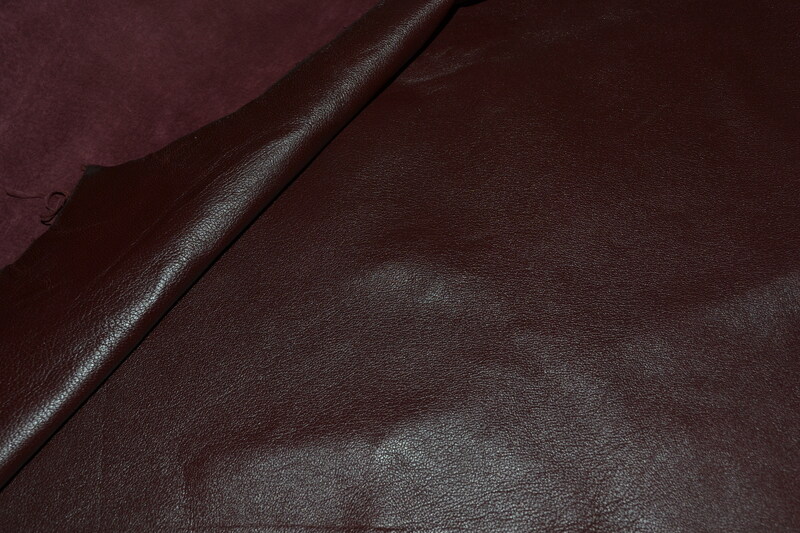 I bought a small piece of burgundy leather from Habermans, to trim a dress. They had some beautiful wool, but my stash guilt set in and I passed it by. 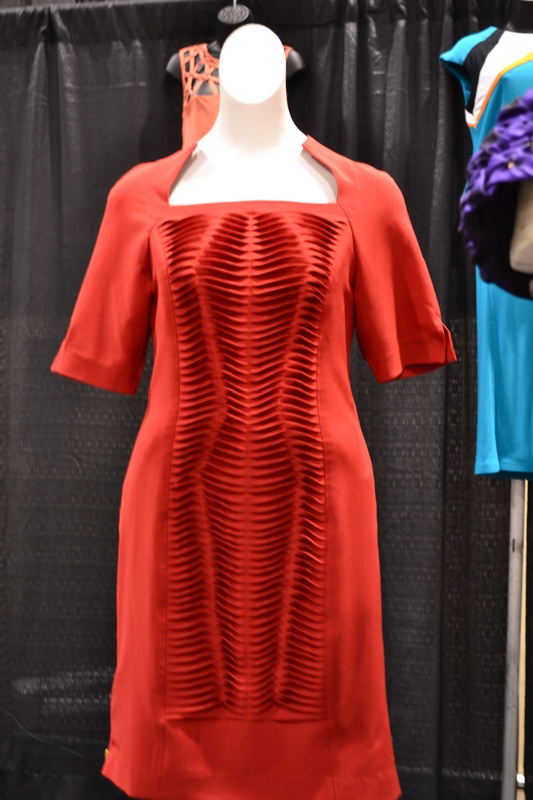 The Wool House from Toronto had some gorgeous pieces, you can’t walk past their booth without touching the wool cashmere blends, but again, stash guilt. I’m strictly a fashion sewer, but the quilters seemed to have a lot to look at and buy too. 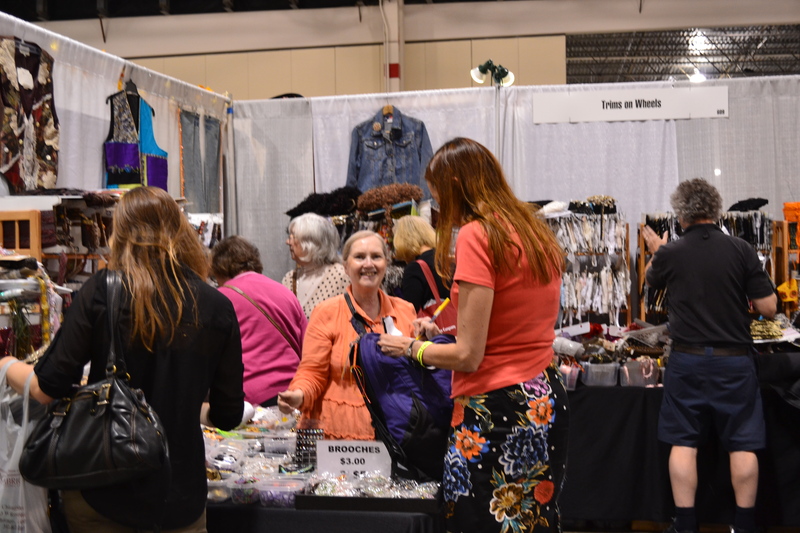 I checked out some of the booths carrying notions and sewing gadgets, along with the Kai Scissors booth, but happy with my purchases, my shopping was done. 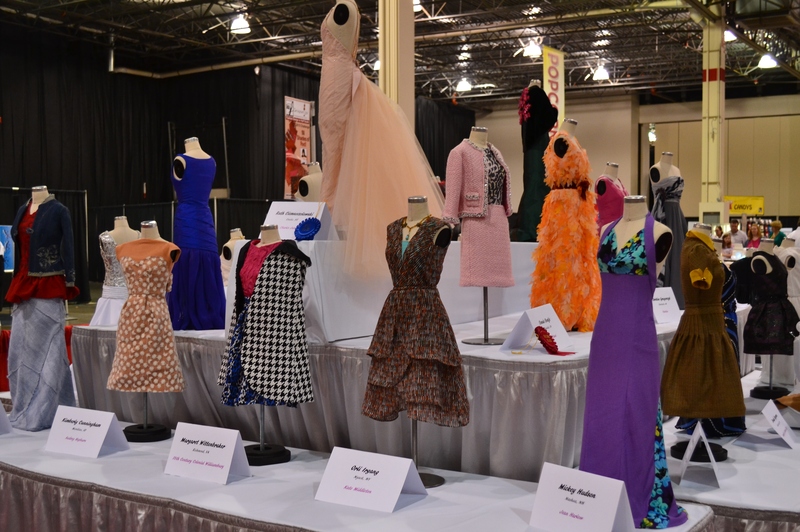 My timing was off and I didn’t make it to any of the fashion shows, but checked out some of the many displays. Joi Mahon had a trunk show, aren’t the black and white dresses great? 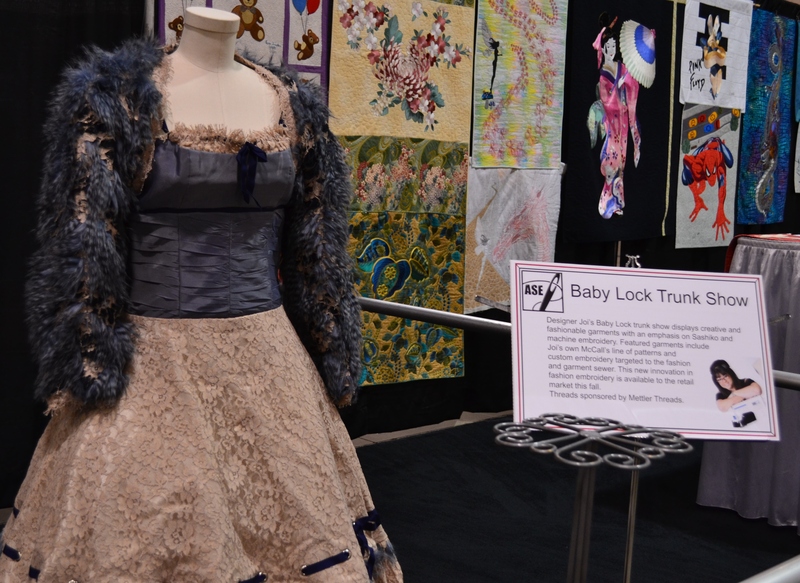 The 1/2 scale challenge, sponsored by ASE, Designer Joi and Baby Lock, had the theme: Fashion Icons thru the Ages. Look at the sewing machine in the photo below, left, to get the scale of these wonderful little garments. This challenge will run again next year, with a new theme to be announced soon. 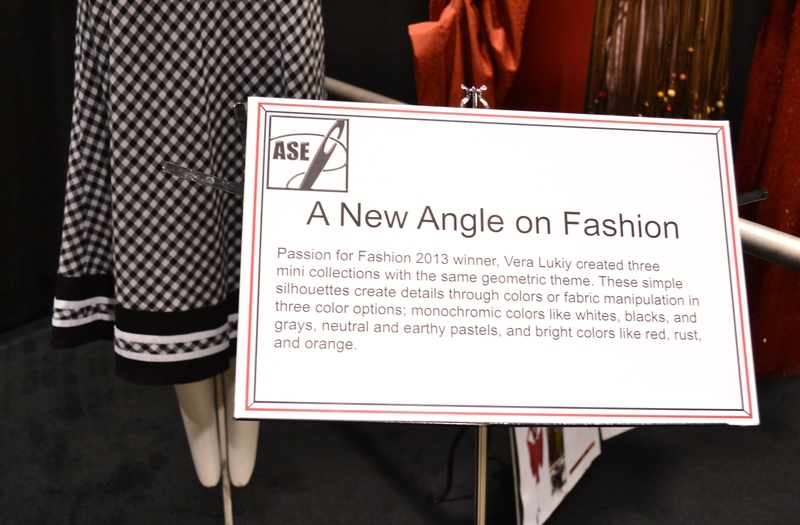 Last year’s ASE Passion for Fashion winner, Vera Lukiy, manipulated fabric to create these dresses. 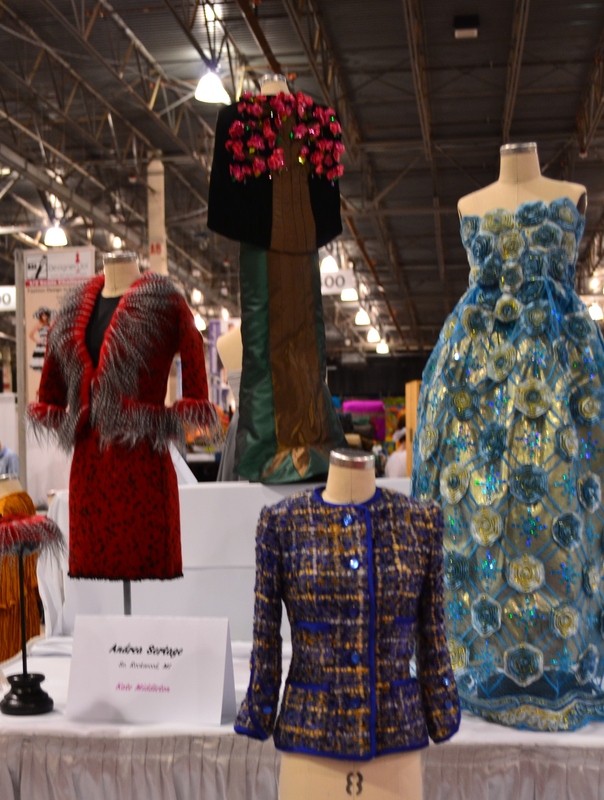 Costume Fantasy, created by area costume designers. 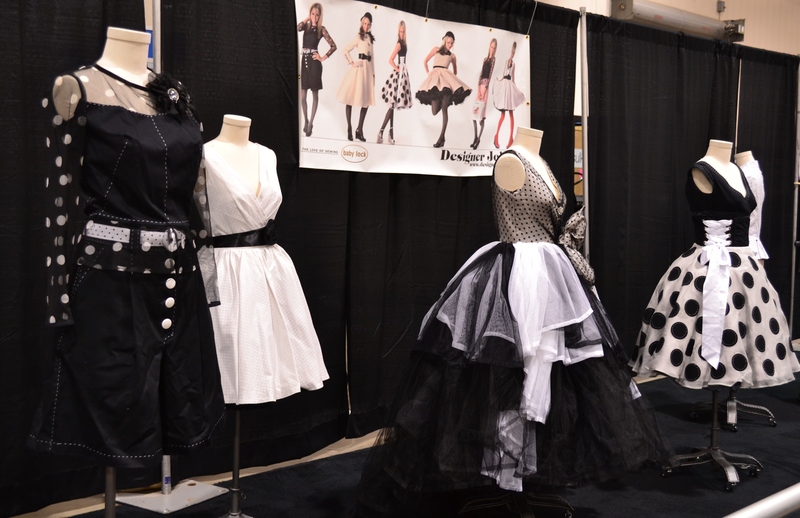 Passion for Fashion is one of the biggest events of the weekend. 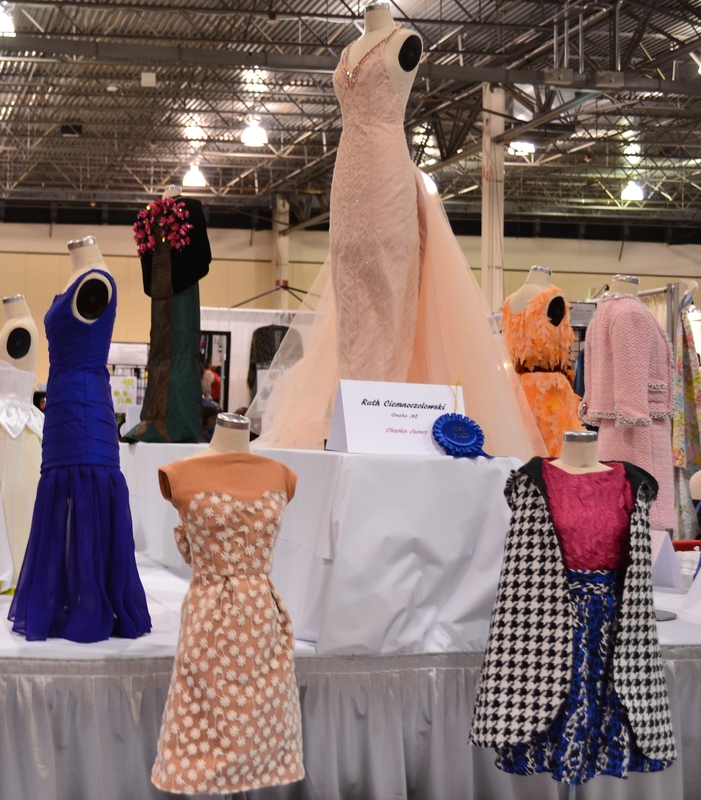 The finalist chosen to participate are given the theme and and funds to shop the expo on Friday morning. 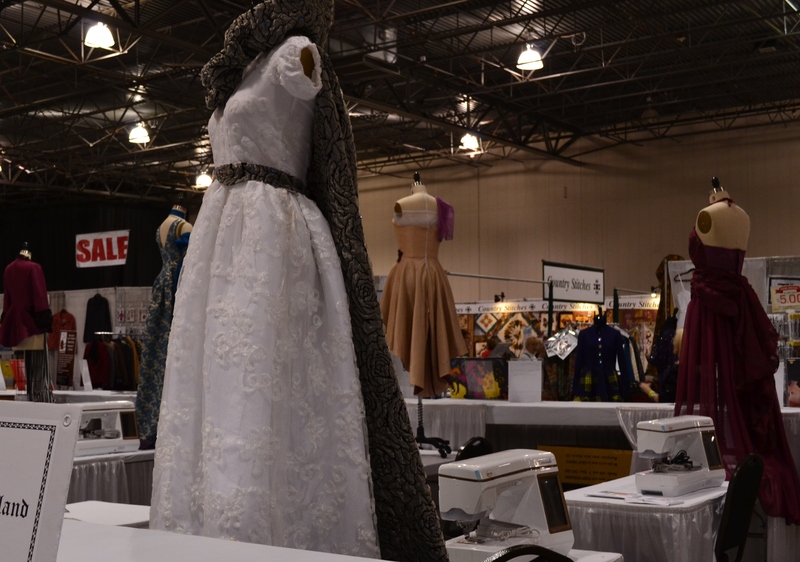 They complete their work on the show floor, in front of everyone, in 2 days. How stressful is that? 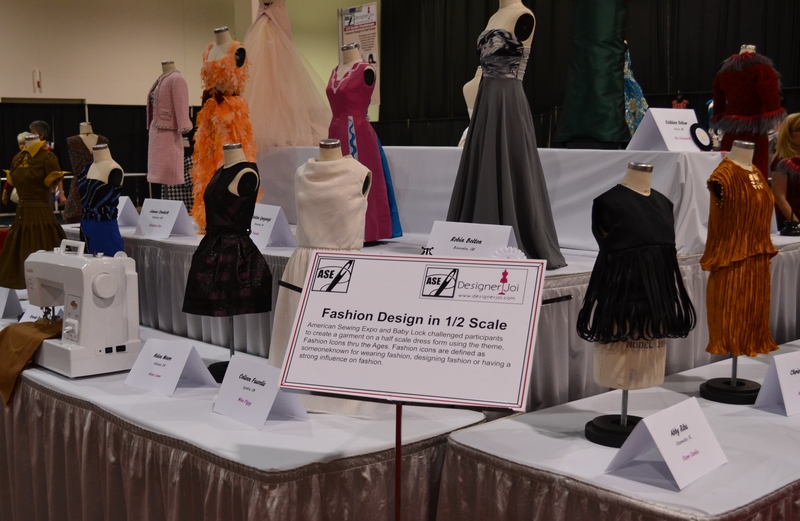 The runway show and judging is Saturday evening. 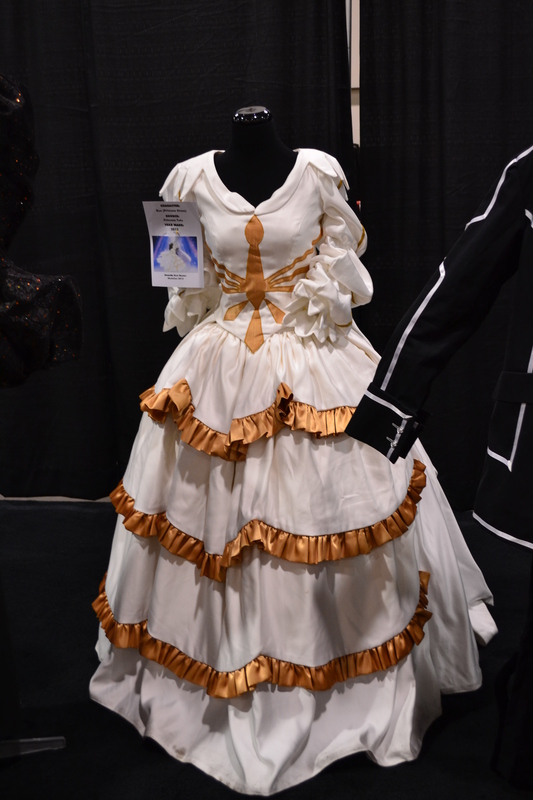 The theme related to the costume/cosplay theme for the Expo. 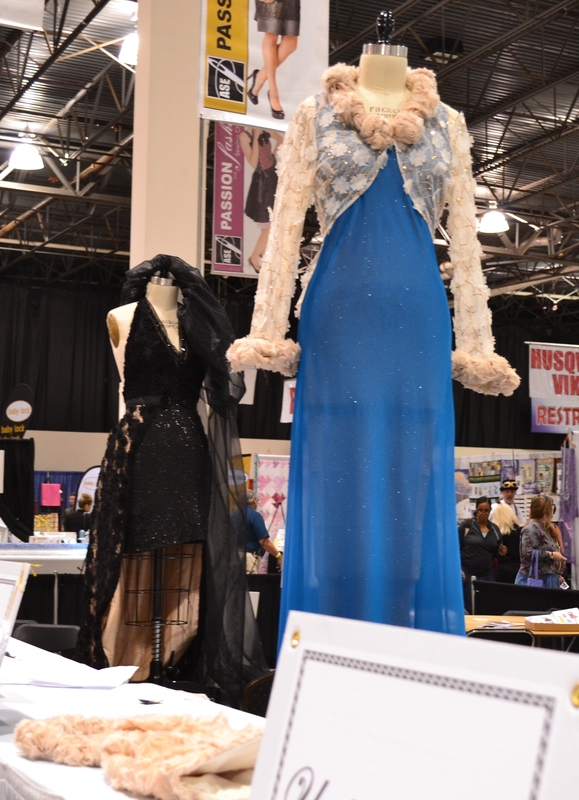 This year’s winner was the black dress below, left. The expo has much more to see and do, more to come next week. Looks like loads of fun. 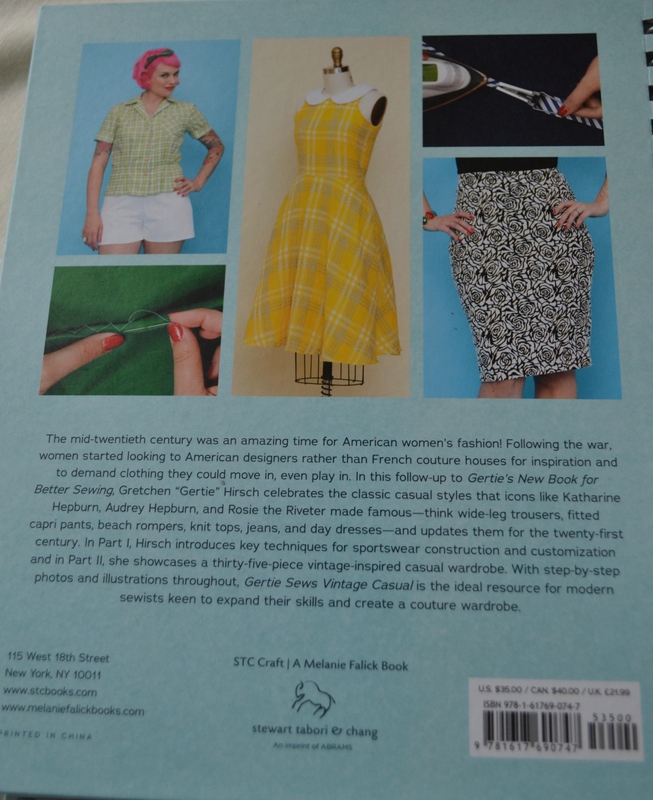 I’m interested to see if the trim book you bought has ideas for French jacket trim. Enjoy your new serger. Thanks, I think the book has something that could help make trim. 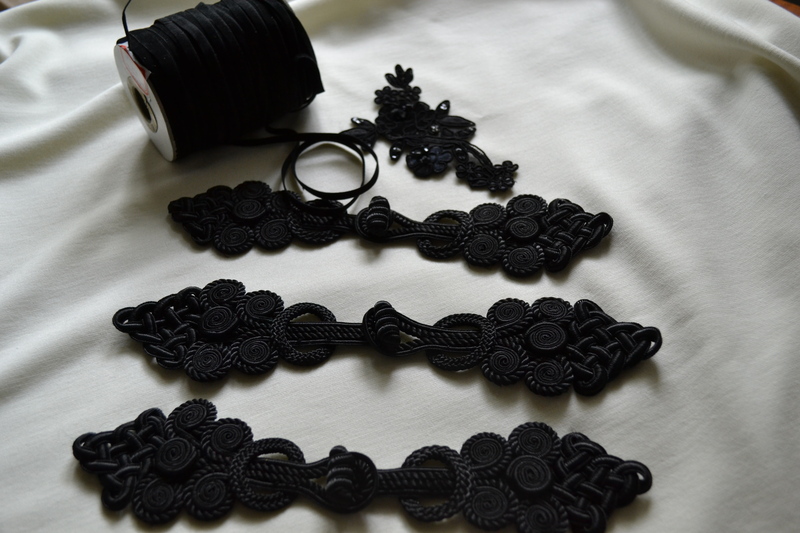 She uses a rolled hem stitch onto the stay tape, with some decorative thread to create a trim. I’ll post some photos in my next post. It is always inspiring to go to an expo. Now if I could just find the time to use what I bought. Yes, I have been MIA. First I had to be away quite a bit, helping my mother move to assisted living and trying to get her house ready for sale. Then I developed a detached retina and had to have surgery. 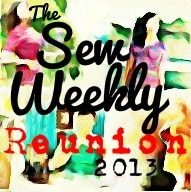 My vision is still slightly distorted, but I’ve been sewing and will get back to the blog soon. Thank you. Thanks for the review on the Expo. I have been to Puyalup but not Michigan. I was thinking of going to Michigan next year, I was curious of the comparison of the two shows. Although I would love to visit Puyalup, I’ve never been. I did look at their brochure and they are bigger than the one in Michigan. Other differences I see: ASE does not include knitting, ASE have some all day and 2 day seminars, ASE has been increasing the competitions they offer, but does not have the evening entertainment type lectures Puyalup has. 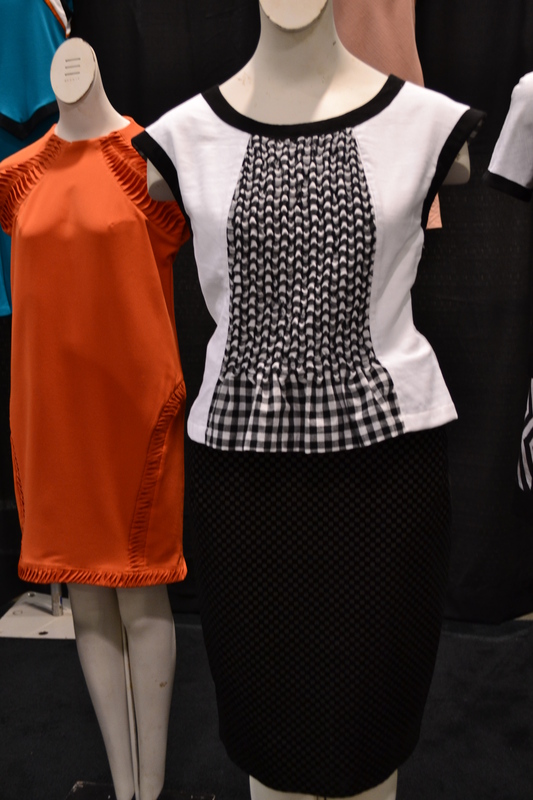 There are quite of few companies and teachers who are at both expos, but Puyalup has more overall. If you have any questions, let me know.